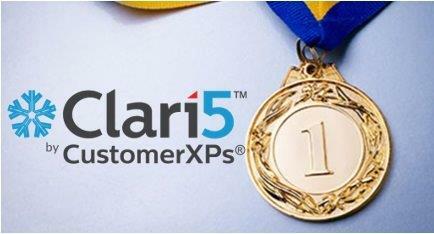 Clari5’s financial institution customers are continuing to receive highly coveted acclaim from global industry bodies for adopting Clari5’s novel cross channel approach to fighting financial crime. 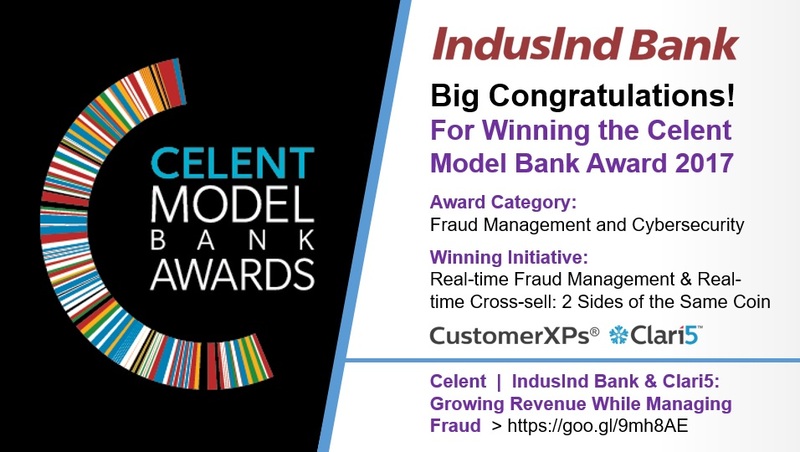 IndusInd Bank has won the Celent Model Bank of the Year Award For Growing Revenue While Managing Fraud. This is an endorsement of Clari5’s ‘Yin & Yang’ Approach to Fraud Management and Cross-sell. Mridul Sharma, ‎EVP & Head of Technology, IndusInd Bank said, “Clari5’s ‘central nervous system’ not only helped us prevent fraud in real-time across channels, but also delivered real-time actionable insights for cross-sell and upsell.” Read more on the IndusInd Bank website and in Express Computer. 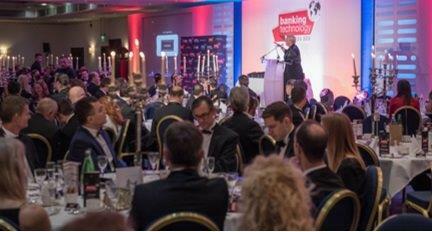 One of Clari5 early customers, Karnataka Bank, earned the ‘Highly Commended’ citation for ‘Best Use of IT for Risk and Compliance’ at the prestigious Banking Technology Awards in London in a glittering ceremony attended by luminaries from the global banking industry. Karnataka Bank had also earlier won the Indian Banks’ Association (IBA)’s Banking Technology Award for Best Risk and Fraud Management’. Clari5 meanwhile is increasingly becoming the partner of choice for leading financial institutions. Several new banks were added to Clari5’s fast growing client roster including Philippines’ 7th largest bank and the world’s first and largest Islamic Bank. 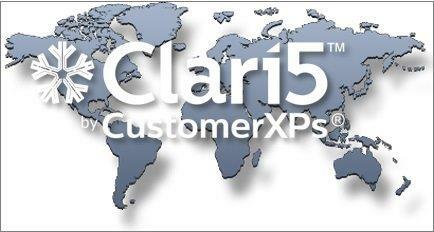 Clari5 is now present in 7 countries across North America, Africa, Middle East and Asia Pacific. By adopting an intelligent and smart technology like Clari5, banks are able to focus on their core business instead of investing in heavy infrastructure and reduce regulator penalties for non-compliance. Clari5 also recently bagged the Golden Globe Tigers 2017 ‘Best Banking Enterprise Fraud Management For Islamic Banking’ Award at Kuala Lumpur. Previously Clari5 had bagged the Risk.net ‘Best Fraud Detection Product Award’ – an iconic recognition that is the global equivalent of bagging an Oscar for Best Picture – in London. Read more on the Risk.net website. Clari5’s parent company CustomerXPs was positioned in premier analyst firm Chartis’ RiskTech Quadrant on ‘Enterprise Solutions for Fraud Technology’ for market positioning and completeness of offering. 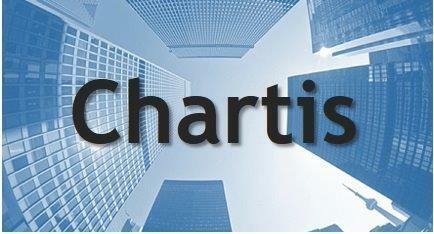 The company was also featured in Chartis’ RiskTech 100 rankings for the 3rd consecutive year. 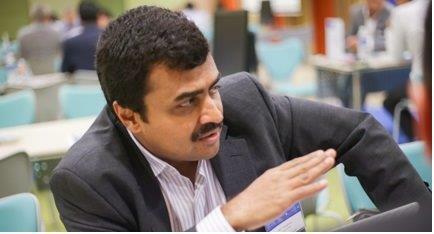 Given its 191% revenue growth last fiscal, CustomerXPs was featured in Deloitte’s prestigious Technology Fast500 AsiaPacific and Fast50 India listings. View the full report here. 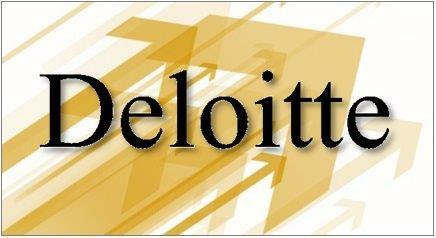 “This trend can be directly attributed to an increased global uptake for a unified approach to fraud management.